Johann Pachelbel was born and died in Nürnberg in Bavaria. One of his first teachers was Georg Caspar Wecker. At the age of 16 he entered the university of Altdorf, but was forced to leave it within a year as his father couldn't afford to support him. However, because of his exceptional academic qualifications he was accepted as a scholarship student at the Gymnasium Poeticum in Regensburg. Here he also studied music under Kaspar Prentz, a protégé of Johann Caspar Kerll. Pachelbel was clearly influenced by Kerll, and through him by the Italian style. He worked for some time as deputy organist of the St Stephansdom in Vienna. After this he went to Eisenach - where he established contacts with members of the Bach family - and then to Erfurt to act as organist. Between 1690 and 1695 he worked in the same capacity in Stuttgart and Gotha. In 1695 he was invited to become organist of St Sebaldus in Nürnberg, an offer he gladly accepted. It is a token of his high reputation that no examination took place nor the organists of other churches in Nürnberg were invited to apply for the position. Also the fact that he had many pupils attests to his importance as organist and composer of organ music. It was in Nürnberg that Pachelbel also composed many vocal works, which are hardly known today. Both discs include a number of Magnificat-fugues. Pachelbel wrote around 90 of such pieces which date from his time as organist of St Sebaldus in Nürnberg. The Magnificat was part of the Vespers, and it is often suggested that these fugues were used as intonations to establish the pitch for the singers. However, Belotti comes up with a different explanation: they may have been used as part of the alternatim performances of the Magnificat. "The 12 verses in this canticle were presented in Latin by the choir and organ in alternation, with the organ playing the odd-numbered verses (1, 3, 5 etc) and the choir singing the even-numbered ones. In other words, each agent had six verses to perform. (...) Usually four fugues form a Magnificat cycle in a particular ecclesiastical mode." This means that two verses are missing. Belotti suggests that Pachelbel may have expected organists to improvise short toccatas on the first and last verses. The bicinium Wo Gott der Herr nicht bei uns hält (CD 2, track 6) was discovered recently, although its authenticity is not established. The cantus firmus is first played in the upper voice and then in the lower voice. Pachelbel treats the hymn melodies in different ways. Sometimes they are played unchanged, but in other cases they are highly ornamented, in the style of diminutions. Nun lob mein Seel den Herren (CD 2, track 4) is notable for the cantus firmus being in the tenor, which is rather unusual. Another recent discovery is the Aria in G. It is of the kind we know from the collection Hexachordum Apollinis. The present piece includes five variations, one of them - as was common in Pachelbel's arias and chorale partitas - dominated by chromaticism. This disc again includes some pieces of doubtful authenticity. Above I already mentioned one, and another one is the last item of the second disc, the fugue on An Wasserflüssen Babylon. Belotti suggest that it may be an arrangement of a piece by Pachelbel, made by one of his pupils. 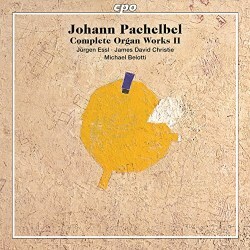 Like the first volume this disc includes a piece by Pachelbel's teacher Georg Caspar Wecker, the Fugue in B flat, added to Pachelbel's toccata in the same key (CD 2, track 9).